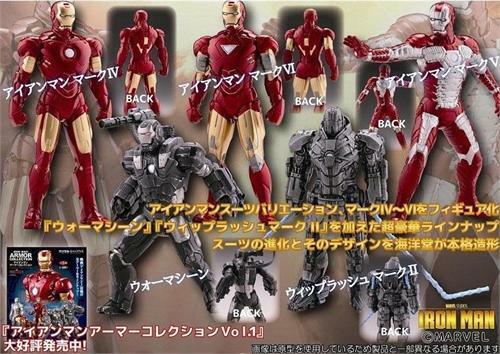 Five new Iron Man armors are presented in Kaiyodo's upcoming Capsule Q Iron Man Armor Collection which ship in June 2014. The figures measure 10cm or 3.93" tall and are made of PVC. Kaiyodo is supplying the armors randomly inside gashapon containers but NCS will gather together complete sets of five at US$30.90. Kotobukiya is proud to add the IRON MAN 2 MOVIE IRON MAN MARK IV ARTFX STATUE to the Marvel Studios collection! In the upcoming Iron Man 2 movie, the bad guy "Whiplash" is played by Mickey Rourke. In the Iron Man movie from earlier this year, viewers got to see Tony Stark work on his mechanical reactor-powered prototype as well as the final version of the Iron Man suit. Based directly off the actual movie prop from the blockbuster Iron Man, using reference from Stan Winston Studios, we bring you Tony's "heart" as given to him by his thoughful assistant Pepper! 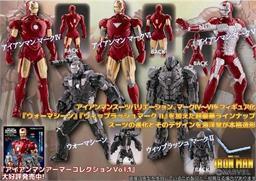 From the much-awaited sequel in the Iron Man movie series 'Iron Man 3' comes a Nendoroid of the Iron Man Mark 42 Suit!